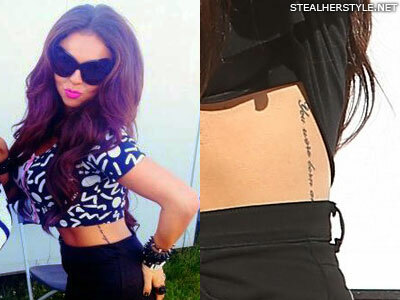 Jesy Nelson revealed a new tattoo on the left side of her ribs at the Global Awards on March 1, 2018. 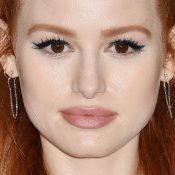 It says “Keepers” and it might be part of a matching “Finders Keepers” tattoo with someone else, possibly her boyfriend Harry James? 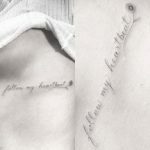 Tattoo artist Gabby Colledge does these cursive tattoos in her own handwriting for an organic but imperfect look. 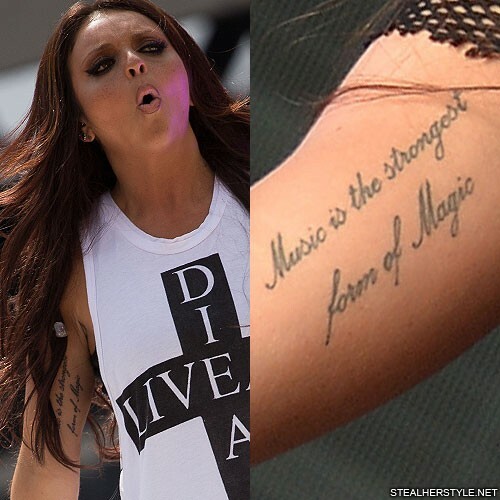 Looking through her portfolio, her letter “r” has a tall loop in many of her designs, including Jesy’s own “girl power” tattoo. 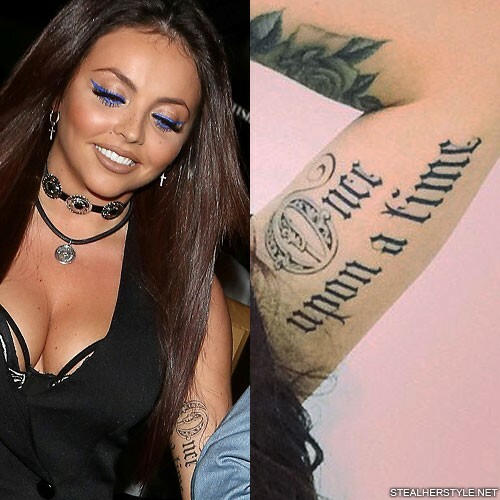 Jesy Nelson got three tattoos on her right hand all at once in January 2018. Her middle finger knuckle says “amor” which means “love” in Latin, Spanish, and Portuguese. 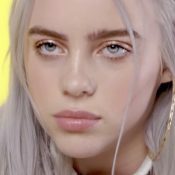 On her index finger and ring finger are the letters “E” and “J.” These initials are a bit of a mystery since her boyfriend’s name is Harry James. 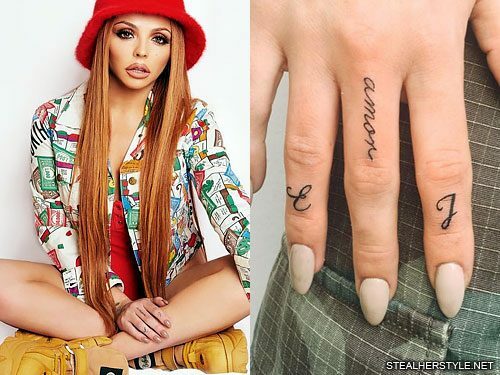 It doesn’t match any of her family members either — her parents and siblings all have names that start with a letter “J.” The “J” might stand for Jesy, but we don’t know who or what the “E” represents. 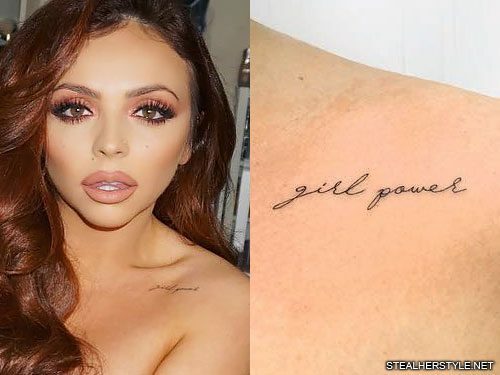 Jesy Nelson got this “girl power” tattoo on her collarbone from artist Gabby Colledge in January 2018. As a girl group, Little Mix’s music is all about women taking charge and standing up for themselves. 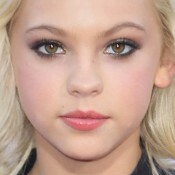 They want female listeners young and old to feel empowered and confident. 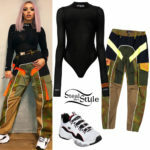 “If a girl is being bullied, or heartbroken, or just feeling like utter shite, if our music can make them feel better… then we’re doing our jobs right,” Jesy says. 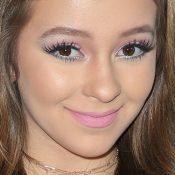 The term “girl power” has been deeply entwined with female pop groups ever since the Spice Girls made it their slogan in the 1990s. Girl power is all about women supporting each other and building each other up rather than competing and tearing each other down. 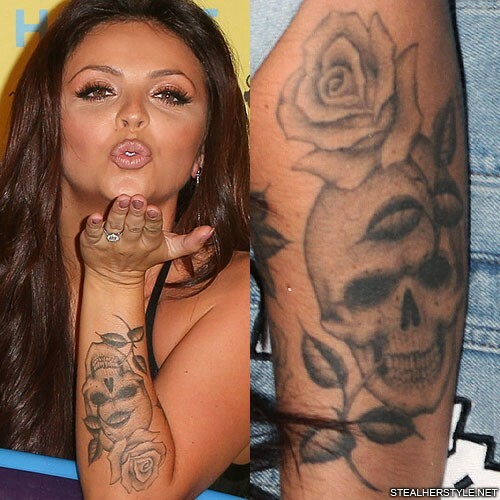 Jesy Nelson got a rose tattoo on her right arm in September 2017. 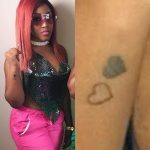 It is placed so that the flower is on the back of her hand and the stem is on her forearm. 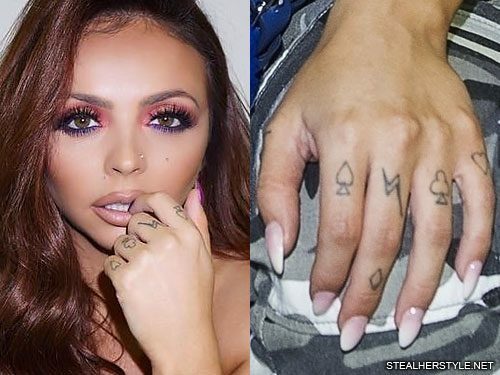 Jesy Nelson got six symbols tattooed on her left hand knuckles all at once in February 2017. 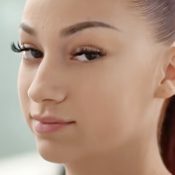 She has the four suits from a deck of playing cards — ♤ spades on her index finger, ♢ diamonds on her middle finger, ♧ clubs on her ring finger, and ♡ hearts on her pinkie — as well as a ✝ Christian cross on her thumb and a ? lightning bolt on her middle finger. 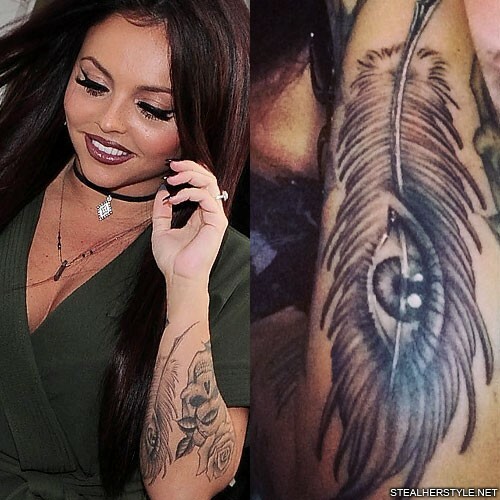 Jesy Nelson got this tattoo of a feather and eye on her left forearm in August 2015. She visited the studio of famed tattoo artist Bang Bang in New York City. “Always wanted to be tattooed by the amazing @bangbangnyc and I finally did yesterday,” she wrote on instagram. 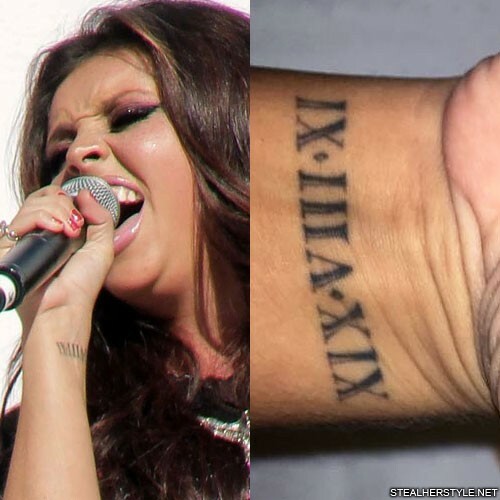 In August 2013 Jesy got a Roman Numeral tattoo on her right wrist which says “XIX-VIII-XI” or “9-8-11.” In the British way of writing dates this would be August 19, 2011–the day that Little Mix were formed during bootcamp on The X Factor UK series 8. 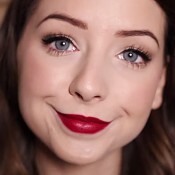 Little Mix went on to win the competition and were the first group ever to do so. 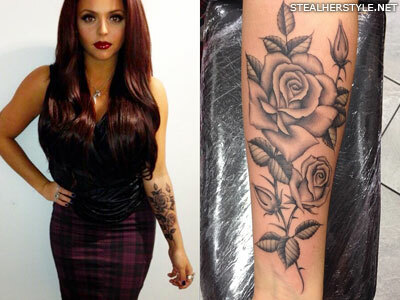 Jesy literally has a lot of roses tattoos! 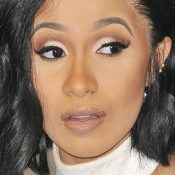 I wish she wouldn’t have them! But I’m just saying!????✌?? She has 5 now!!!! 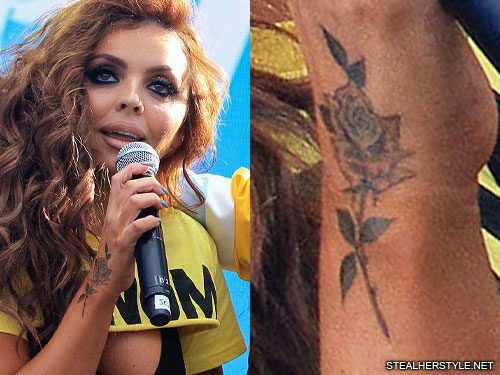 She has those two, the date that little mix got put together in roman numerals on her right wrist, another script tattoo going down her left side, and now her large left forearm floral piece! 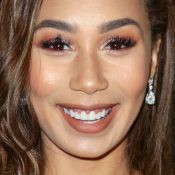 Can you do Leigh-Anne Pinnock’s tattoos? 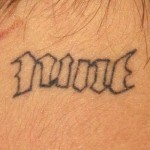 She has one on her neck and back. 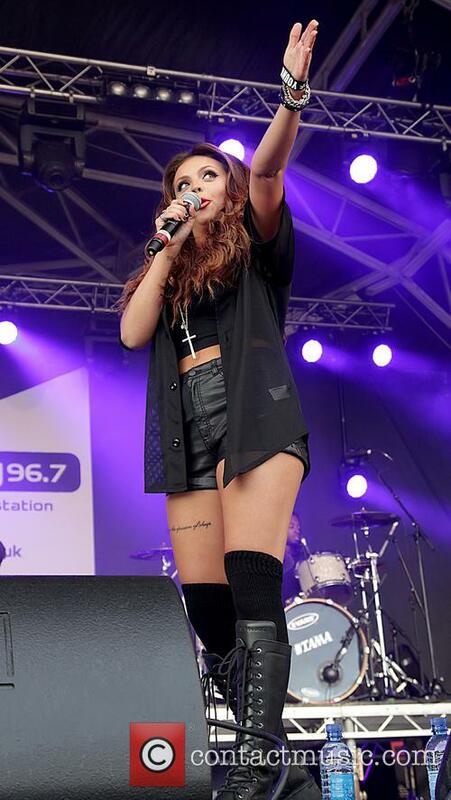 can you do jade thirlwall’s tattoo? she has one on her spine.